A screen shot from Jim Sweet's "Mummy's Tomb" Youtube video, utilizing basic animation techniques reminiscent of 1960s "Clutch Cargo" cartoon serial. 6 years ago, GIjOE fan and animator, Jim Sweet, wanted to make a video representation of one of his favorite childhood possessions—the 1960s Peter Pan book and record, GIjOE and the Secret of the Mummy’s Tomb. But Sweet also wanted to take his project one step further, and rather than merely photograph the pages of the comic, he decided to add original elements utilizing his own animation skills. The result turned out to be a unique and imaginative retelling of the classic story. A screen shot from the opening of a Clutch Cargo cartoon. Each daily episode was only 4 minutes long, with a weekend recap episode of 30 minutes. Clearly drawing inspiration from another childhood favorite (the crudely-animated 1960’s adventure serial, Clutch Cargo), Sweet decided to animate the mouths of all Tomb characters while leaving the rest basically static. This was very similar to what was done in Clutch Cargo. Back then, in order to meet tight production deadlines and even tighter budgets, the characters were very simply drawn, rarely moving, with only their mouths animated by a then-new “Synchro Vox” animation method. Sweet's animation, as in the classic Clutch Cargo serial, moves only the mouths of the characters, leaving the rest of the artwork to stand on its own. Flocktastic offers a wide variety of colors, hair lengths, custom blends, even flocked eyebrows! The potential for Flocktastic’s new business is huge. Around the globe, there are literally thousands of collectors who own figures that are replete with patchy bald spots or worn-off beards. All of which would benefit from a trip to a professional reflocker. Imagine if every figure in YOUR collection suddenly sported a new, perfect head of hair. What a difference it would make! As children, few of us gave any thought to the care of our beloved “Fuzzheads.” Hats and helmets of all types were roughly crammed onto their noggins. We tossed them repeatedly them into swimming pools. Boiled them in bath water. And even gave some haircuts and trims of our own (thanks, Sis!). 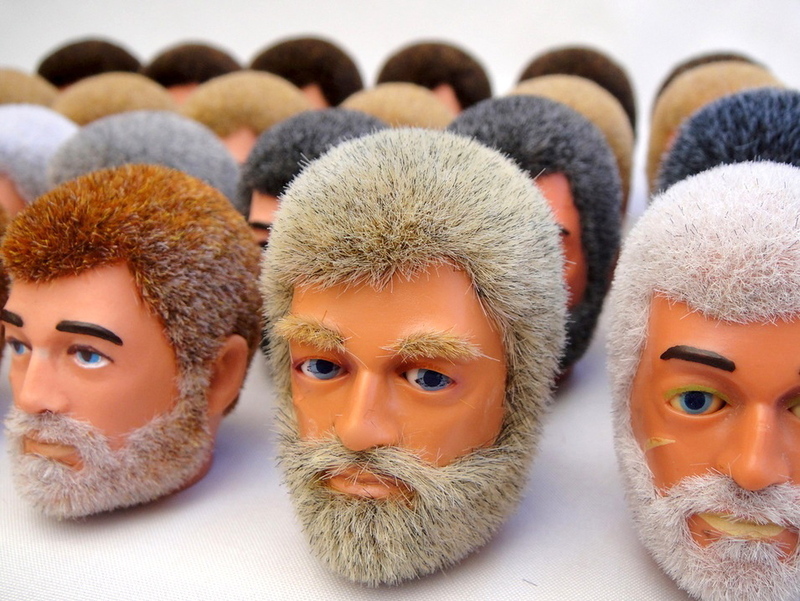 The results were predictably awful, resulting in thousands of balding and hairless action figures. 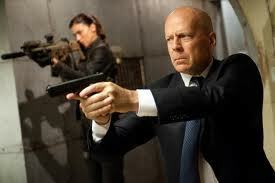 Nowadays, as adults (and mostly men), we’ve grown somewhat more, shall we say, “sensitive” to the issue of hair loss. And we wish to correct such “injustices” whenever and wherever possible. 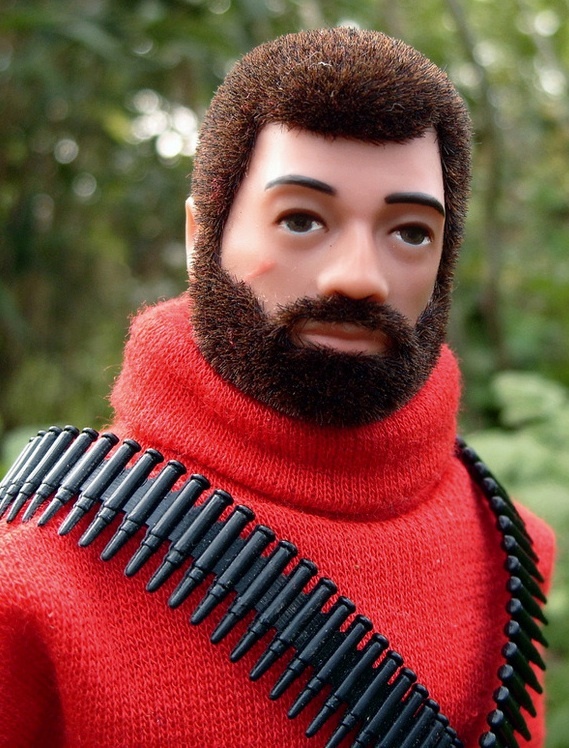 ESPECIALLY when it has to do with our beloved Action Man/GIjOE/Geyperman action figures. “Simply send the head(s) to us and we will strip off the existing flock and re-flock it according to your choice of colour, length and style.We currently have 40 individual colours in 5 different lengths to choose from. From these base colours, flock can be mixed together to create virtually any hair colour you can think of. Bottom Line: This is great news. Think about it. If we all just skipped a couple of cheesburgers this week, we could afford to get one of our old VAM or GIjOE heads flocked instead. What a deal! Happily, it seems as if Flocktastic is off to a great start with their new business. We wish them and their “fellow flockers” the very best of success! I don’t think Dennis has anything to worry about. No “knock-off” copy will EVER come close to the high-level of quality and character evident in his work. 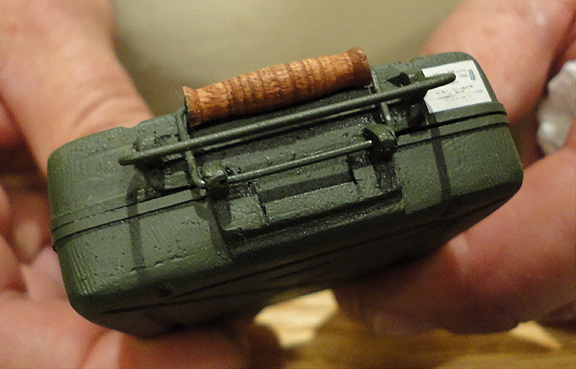 Widner confirmed that he makes everything by hand, using a mixture of hand-sculpted resin parts, tiny wooden pieces, working metal hinges and clasps, and even miniature metal nails (they’re so tiny!). The final results are simply astounding. You need to hold them in your hands to really appreciate the quality. Each crate or case looks, feels and even SMELLS like its 1:1 counterpart. 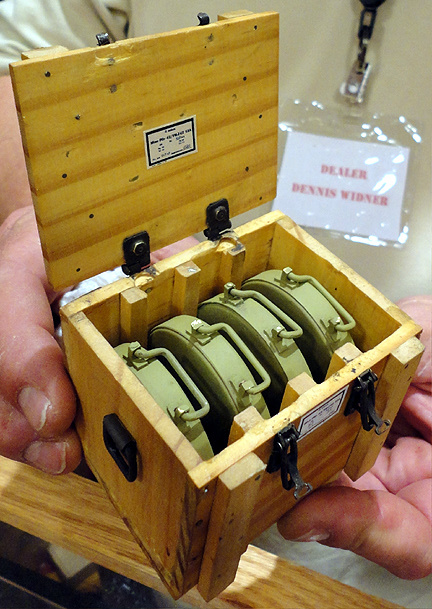 Some of Dennis’ amazing work includes (from l to r): US 50cal ammo crate, 2cm German flak gun magazine case, 8cm German mortor case and (far r) the “holy grail” Tellermine 42 box. 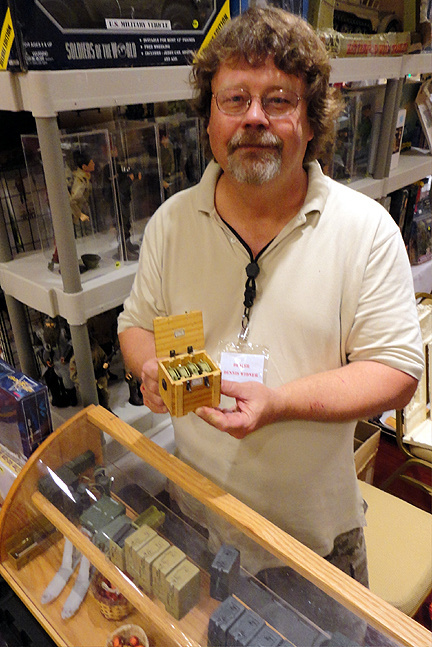 Bottom Line: Before I left his booth, I snagged one of Dennis’ Tellermine 42 boxes for myself (imagine the incredible diorama possibilities). I would’ve completely emptied out his entire display case, if not for my meager, limited funds. ARRGH! Just one of the astounding vintage GIjOE sets being auctioned on March 29th in the UK. Wake up, Joeheads! 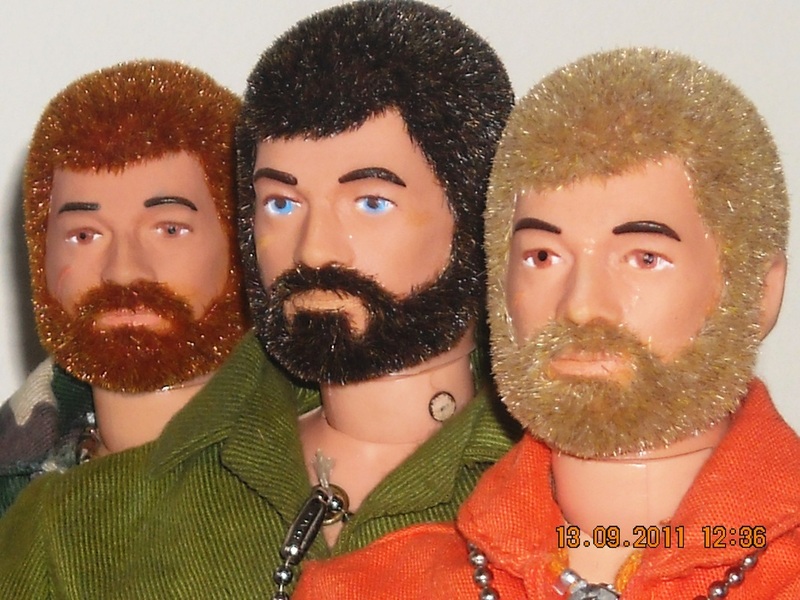 That BIG, vintage GIjOE auction over in the UK takes place early TOMORROW. That’s at the crack of dawn, on Thursday, March 29th. 1) There’s at least a 6-hour time difference between the U.S. and the U.K. Their website says the auction will begin at 1PM. That’s UK time, not your local time. 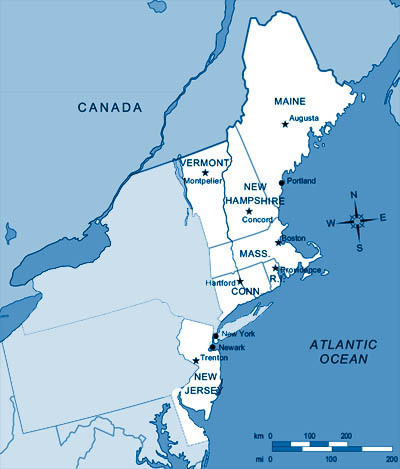 Roughly speaking, I believe that’s about 6 or 7AM on the East Coast and much earlier (3 or 4AM?) on the West Coast. Check your specific time-zone and be sure to compute the auction’s actual starting time accurately. 2) No matter where you live, you can bid ONLINE. Go to the Vectis website and review their online bidding procedures, policies, etc. To place bids, you’ll need to be logged in and following their specific instructions. 3) Prices will be in British Pounds or Euros. The U.S. dollar is kind of weak right now, so if you plan on bidding, it’s highly recommended you look into the current conversion rate beforehand, so you can do some quick mental arithmetic if required. And yes, they take credit cards. Bottom line, as with any auction, know your personal financially limits before bidding on any item. This event promises to be an excellent opportunity to obtain some very rare, vintage GIjOEs. Take a look at all the PHOTOS once again and review these videos: VIDEO 1 and VIDEO 2. There’s no better way to get completely set for this event. If you win anything, please let us know. Best of luck and Happy Bidding! The toy business is changing again—dramatically—and Hasbro is at the helm of its most recent evolution. 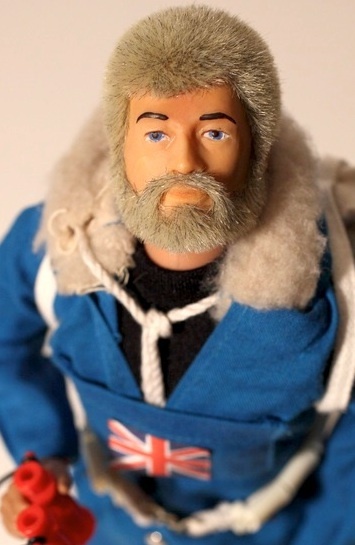 After announcing layoffs of 170 employees here at home and abroad (see our previous post of March 7), the creator of such classic toys such as GIjOE and Mr. Potato Head is now attempting to fight its way back from of the effects of a struggling national economy and sluggish sales, by morphing itself into a new entertainment/licensing/merchandising COLOSSUS. With all of its media guns blazing, Hasbro appears to doing well so far. By creating its own entertainment vehicles (TV shows, animation, films, etc. ), while similtaneously owning all the licensing and merchandising rights, it has cast a much wider net for potential future profits. For example, their franchise-based movie “Transformers” grossed 2.6 BILLION worldwide and the first GIjOE movie earned over $302 million. That’s some serious moolah! 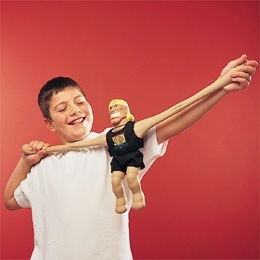 Plans for films based on Stretch Armstrong and the Candyland board game are also in the works. Hasbro has even created its own TV channel known as “The Hub” which is akin to running commercials for itself 24/7. Every base is being covered. And every possible avenue for profits is being controlled—by Hasbro. As the exclusive rights holder to such famous properties, it seems as if Hasbro should be garnering tremendous profits at every turn. But with the increased ownership (of everything) comes increased risk. When a TV show or movie flops, its toy line sits on store shelves unsold and the resulting financial losses can be quite heavy. In addition, trends indicate that children nowadays are simply playing less with toys. Modern-era distractions such as video games, cell phones and the Internet are causing many children to grow up more quickly, leaving less time to simply PLAY. It’s an alarming trend that hasn’t escaped the notice of toy makers like Hasbro. Hasbro has clearly jumped in with both feet. But its new “own it all” approach to business and merging with the entertainment industry comes with great risks. 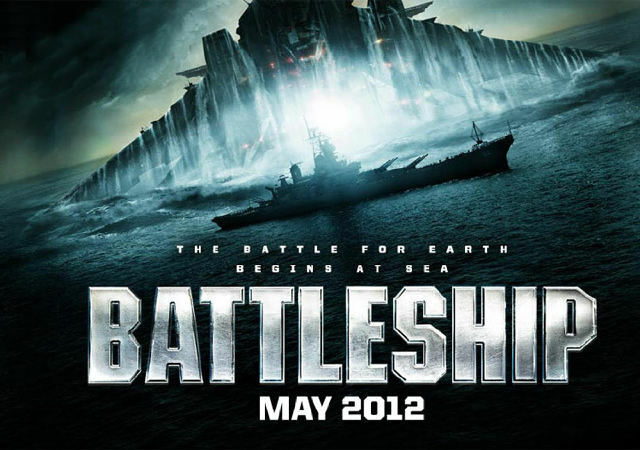 Hollywood will tell you that each new film release is a huge gamble, nothing is ever guaranteed. But if successful, the financial rewards can often be HUGE—for those who own the rights. But seriously guys…Candyland? You’ll see the man long before he ever sees you. You can’t miss him! With his eye-catching outfits, broad, welcoming smile, and warm, easy-going demeanor, E.J. White stands out in any crowd. At the Joelanta show in Atlanta, GA recently, he infused his unique powers of charm into nearly every moment of the proceedings. 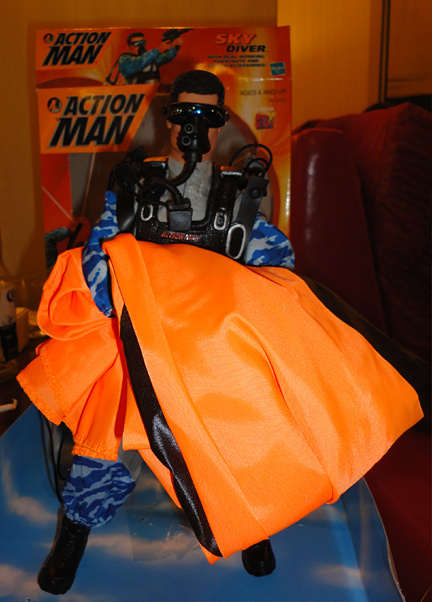 After his two successful freefalls from the top floor, my new Action Man declared, "Thanks to E.J. 's salesmanship, I'm no longer a virgin...parachutist." 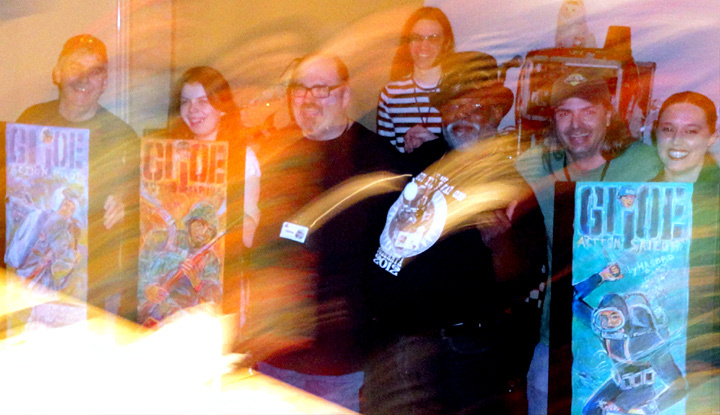 In this "artistic" photo of the charity art auction, E.J. poses with club members and friends. Later, at the Charity Art Auction, E.J. cheerfully acted as a “co-auctioneer” with Buddy Finethy to help build excitement within the crowd. There didn’t seem to be an event that he wasn’t actively and enthusiastically involved in. And for that, we were all very grateful. Go JOE! Go E.J.!!! If you’ve had your head under a rock for the last year, then you probably haven’t heard about the impending arrival of 1960s multi-hero action figure, Captain Action! 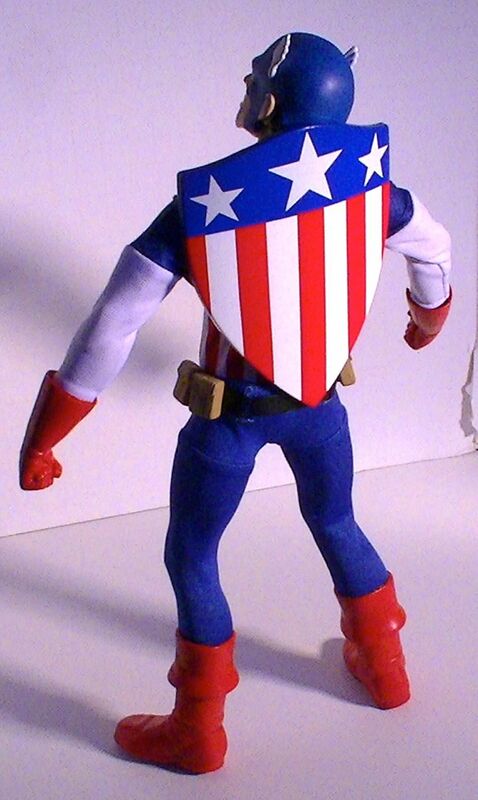 Yes, that’s right, ol’ Cap is coming back to toy stores and online retail outlets near you (pre-orders are crossing our shores as we speak). And as was mentioned in an earlier post, 4 uniform sets have already been announced (Captain America, Spiderman, Thor and Loki). But up until now, we’ve only had sealed, prototype packages to look at. That can be enticing, but also somewhat frustrating. Finally, there are some actual “out of the box” photos over at the Action Figure Times website revealing just how cool these new uniform are going to be. In short, the Captain America set seems to be VERY well made with loads of cool detail (look at the little buckles on that shield strap). 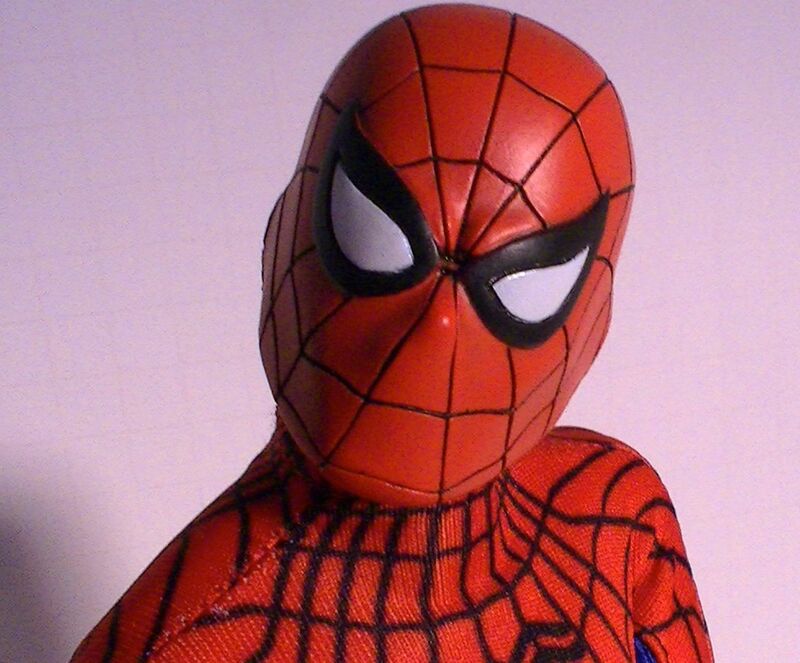 Spiderman looks “interesting,” but not quite as exciting. Bottom line, the new CA uniform sets look pretty fantastic and these new photos will surely stir up collector interest in this new CA line-up. Stay tuned for additional intel as it becomes available. Meanwhile, jump over to the AFT website now and enjoy the photos! The entire year's adventure (for 2011) has been archived and is now viewable online for free. 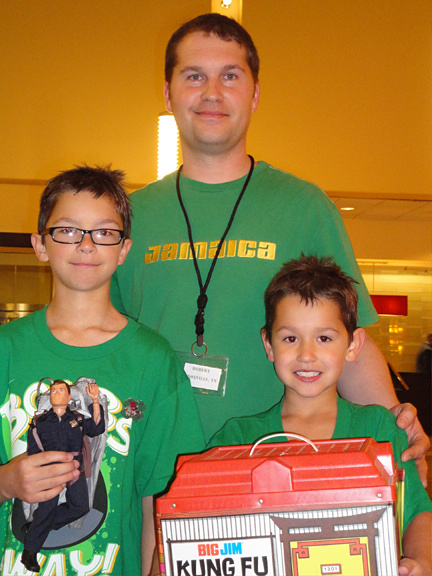 Robert Browning with sons Gus and Ben were all smiles at Joelanta 2012. Since its introduction, GIjOE has always been more than just a toy. The beloved action figure seems to have an instant and “magical” effect, encouraging endless hours of interactive play between friends and family members. Robert Browning, a retail sales manager from Knoxville, Tennessee, brought his two sons along to Joelanta this year, hoping that the three of them would “create some memories together” during the big 2-day event. And so they did! 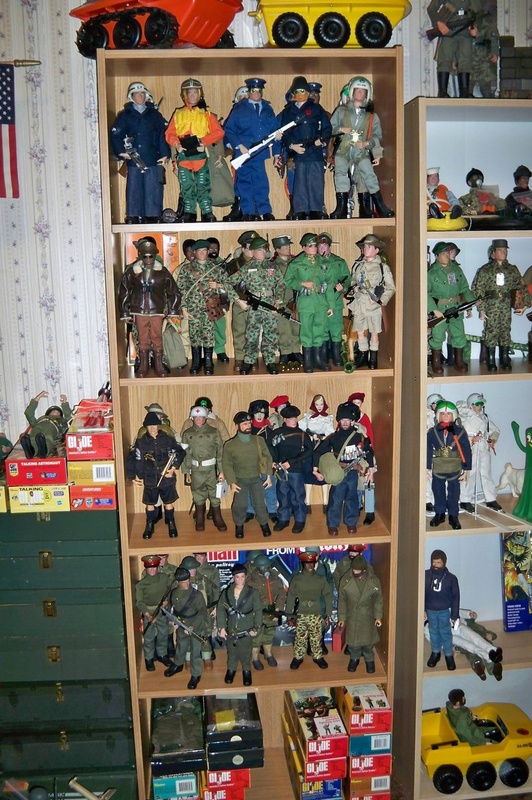 Robert’s been a GIjOE fan and collector for over 15 years now. He remembers playing GIjOEs with his uncle as a kid and enjoys “carrying that tradition through” today with his sons. Later that evening, as the impromptu parachute toss began, he would get his chance to do so again. For about 30 minutes, fans of all ages raced up and down 15 floors to toss and retrieve their parachute Joes and Action Men. There were many other children in attendance that evening and all clearly enjoyed watching the figures slowly drifting back down to the lobby and trying to catch them. The Browning family was no exception as Gus and Ben enthusiastically enjoyed every moment. Toward the end of the show, winners of the various contests were being announced. The Browning trio had entered a custom figure of “The Shadow” and as it turned out, they had won FIRST PLACE! 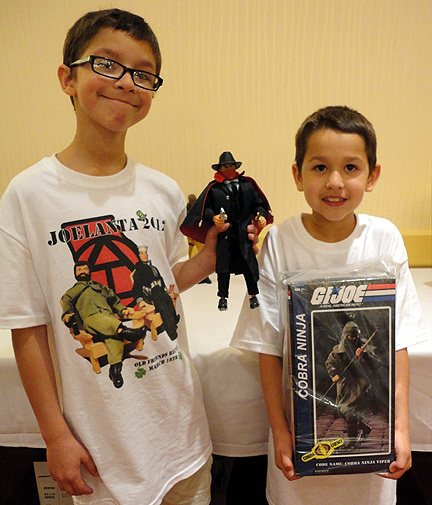 The boys eagerly showed me their prize, an expensive Sideshow Cobra Ninja figure. SWEET. Congratulations, Gus and Ben. 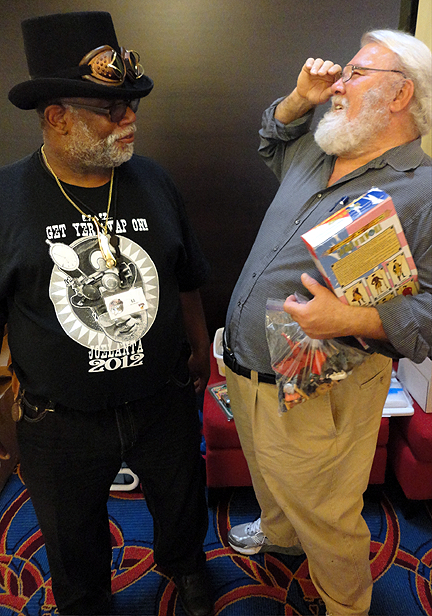 Thanks to your dad Robert, you too, have discovered the “Magic” of GIjOE! A GIjOE club in this part of the country is long overdue. Thankfully, the NEGCC appears to be off to a great start. Lots of cool activities are planned. Members are helping other members. 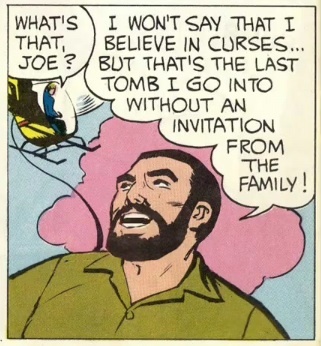 That’s what the spirit of Joe is all about! Best of luck with your new division, fellas. Hope you all have a great meeting tomorrow. GO JOE!